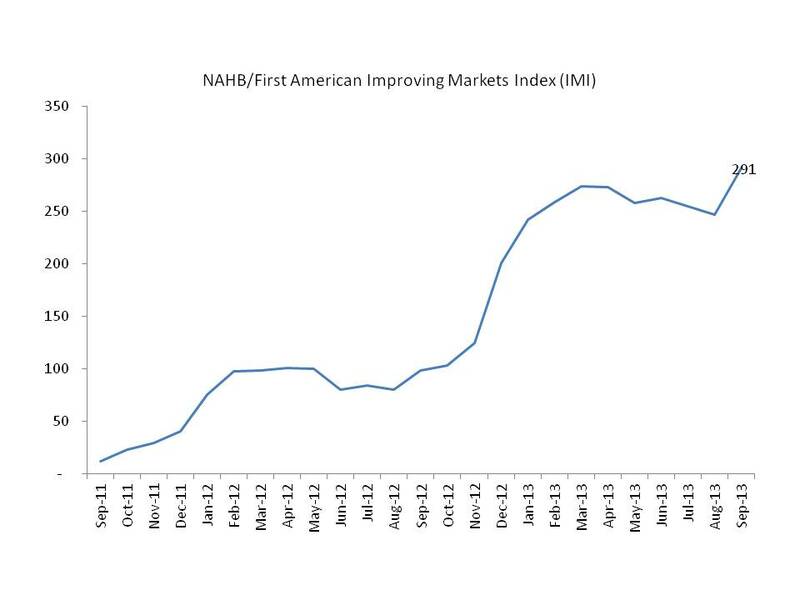 The NAHB/First American Improving Markets Index (IMI) reached a new high of 291 in September. The addition of 49 markets was also the largest number new to the list since December 2012 when 84 markets were added. Five markets were dropped, four because of a fall back in prices and one because of a dip in permits. The large increase in new markets on the list can be attributed to several changes. First, the house price index used for each metropolitan area is calculated by Freddie Mac. After some additional study, the Freddie Mac economist improved the accuracy of their index and the change in methodology increased the rate of appreciation in 89% of the metros on the list. The metro areas that were on the list in August and September recorded an average house price increase of 3.3% from August to September. The increase could also be due in part to seasonality in the price index which tends to rise faster in the spring and early summer (the April price index was the latest available for the September IMI). A similar index increase occurred beginning in September 2012 as those seasonal house prices began to take effect. Finally, house prices have been increasing nationally as more markets and more home sales exhibit rising demand with continued low supply levels. The metro areas on the September IMI are located in every state except Connecticut and that state technically qualifies since two counties in the New York City metro area are in Connecticut. California has the most metros on the IMI, 24, followed by Texas at 21 and Florida at 18. 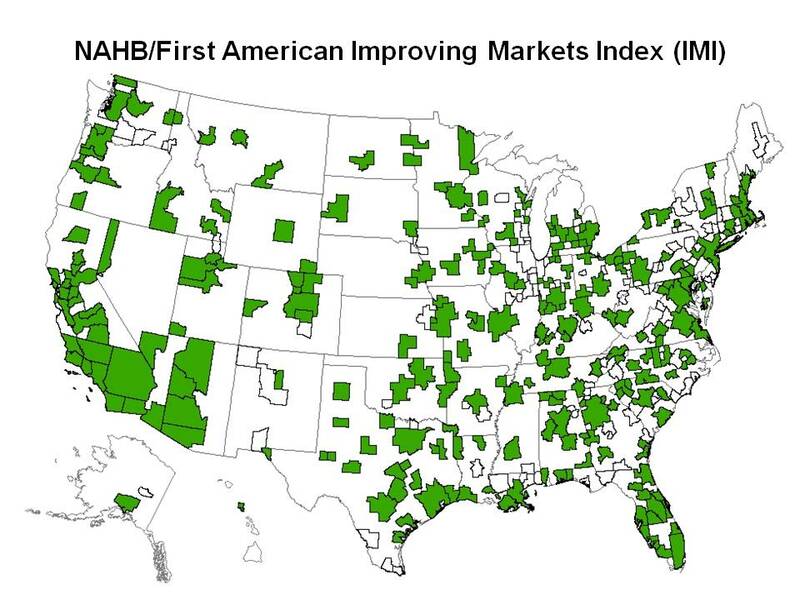 This will be the last edition of the NAHB/First American Improving Markets Index. The index was introduced in September 2011 to reinforce the fact that some markets were starting to show improvement while the national statistics stalled. As the number of markets on the IMI increased, the national measures started to show overall improvement. The IMI has contained more than 70% of all markets since early 2013. The national trend is now more reflective of the individual markets although the distance to a normal market remains wide across metropolitan areas. A new index will be introduced for the October release that will highlight markets approaching their normal level of economic activity. The number of markets on the NAHB/First American Improving Markets Index fell to 247 as 3 were added and 11 dropped from the July level of 255. Most of the markets that fell off had very small price increases that qualified them to be on the list and the latest price indexes slipped back below previous peaks. For instance, Virginia Beach was on the list in July with a 0.7% increase in house prices since January 2012. The average price increase in July for the markets that did fall off the list was 0.5% while the markets on the August list have an average price increase of 7.4%. The small drop in the August list is similar to the stall in the index in 2012 as the not seasonally-adjusted winter and early spring house price data soften when those markets with small increases see price indexes slip down below the previous peak. Last year, the seasonally price effect lasted through August. Every state contains counties of a metro area on the list with California at 24 metros, Texas at 19 metros and Florida at 18 metros. As evidence of the dynamic nature of the IMI, two of the three new entrants in August have been on the list before. Kankakee Illinois was on the list from October 2011 to January 2012 and in June 2013. Since the underlying data is revised, metros can come back sooner than the 6 month requirement for an increase. Ocean City New Jersey reentered the list in August after having been on the list from February 2012 to May 2012. Atlantic City New Jersey is on the list for the first time. 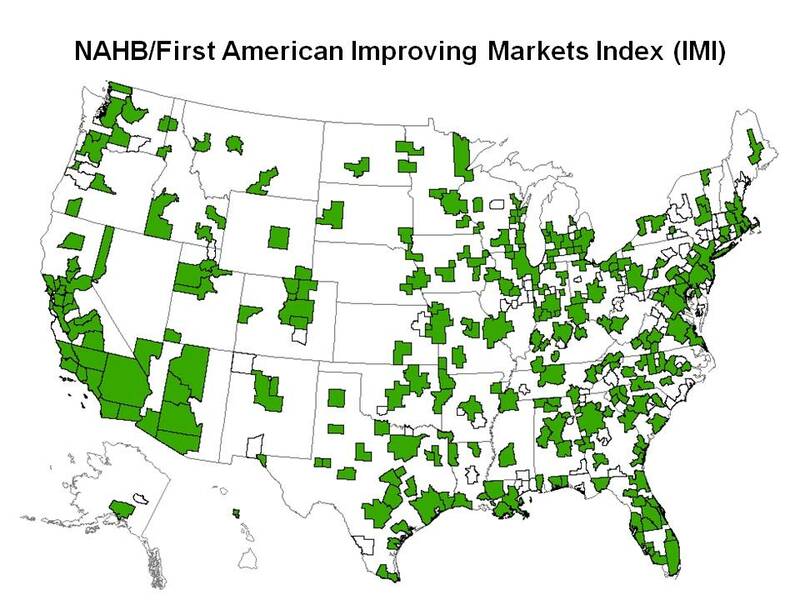 The July NAHB/First American Improving Markets Index dropped slightly to 255 from 263 in June as 14 metropolitan areas were dropped from the list and six were added. The number of markets that are improving remains at over 70 percent of all metropolitan areas with sufficient data (361). The majority of the dropped metro areas had weak house price growth as of the June report and those prices fell back below the previous low for the July report. In June their reported average price growth was less than 1 percent while the metros that remained on the list have an average house price growth of 6.6 percent. The relative peaking in the IMI at about 70 percent of all metropolitan areas for the past six months is a natural outcome of a full national recovery while a few markets sustain just enough growth to qualify but slip back from that marginal growth. Over the nearly two years of the index, 94 percent of eligible metropolitan areas have appeared on the list. The factor that usually knocks a market off the list is house price appreciation and rarely is it more than one of the three factors. House prices are not seasonally adjusted so some weakness parallels the cyclic trend for house prices to soften in winter months. Every state except Connecticut has at least one metropolitan area on the list, although two counties within Connecticut are within the New York MSA which is on the list. As the housing recovery spreads to most markets, the index will likely remain above the 70 percent mark but marginal growth in one or more of the three indicators (house prices, single-family permits and employment) may move the slower moving markets on and off the list. 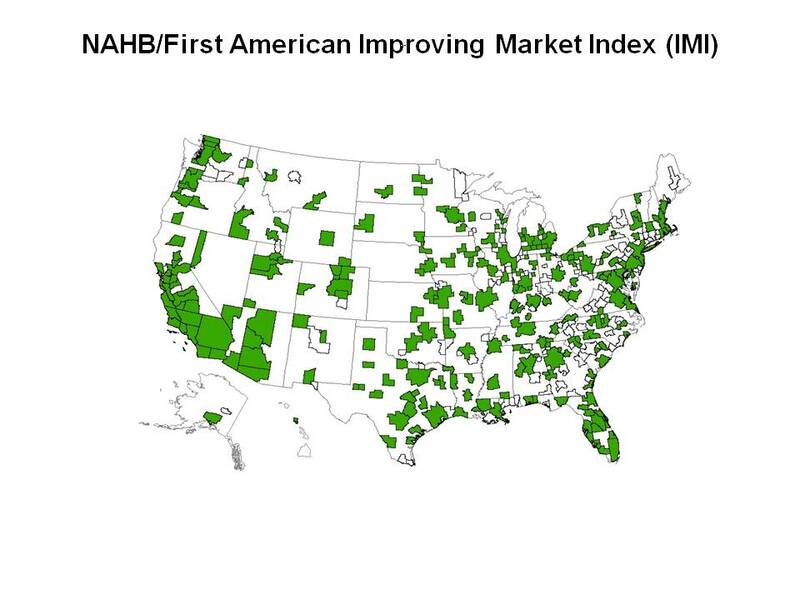 The NAHB/First American Improving Markets Index fell by 15 to 258 metropolitan areas in May. The decline was due to 19 areas falling off the index while four were added. The primary cause for leaving the list was softness in house prices. The 15 metropolitan areas that were dropped from the list because of a fall in house prices had an average price increase in April (the last month on the list) of 1.6 percent while the markets that remained on the list had average house prices increases of 6.7 percent. The 258 metropolitan areas on the list represent over 70 percent of all metros and every state has at least one market on the list. An improving market is one where there has been a six month or more improvement in house prices, single-family building permits and employment. These three critical indicators of a local market health have proven to be good indicators of the overall health of a housing market. The slight decline is in line with a similar decline in the index last year as winter house prices begin their seasonal weakness. The May to June 2012 index dropped 20 percent but the current weakness was less than 6 percent as house prices have gained more stability and momentum since 2012. Texas and California lead the list with 21 metro markets on the list each. Florida is third with 17 markets followed by Michigan at 11 and Indiana at 10. Following seven consecutive months of gains, the list of improving U.S. housing markets remained virtually unchanged in April, with 273 metros on the National Association of Home Builders/First American Improving Markets Index (IMI). After a strong run-up through late 2012 and early 2013, the number of improving markets is holding steady at a high level. We can expect to see more gradual gains going forward as challenges related to increased demand kick in – including everything from tightened supplies of developable lots and skilled labor to the rising cost of building materials. The stability in the improving markets list this month is encouraging, with three quarters of all metros tracked by our index considered on the upswing as the spring buying season begins. In some markets, the main thing that’s holding back a recovery is a relatively thin inventory of homes for sale, which could be resolved if builders had easier access to credit for building homes and putting people back to work. The IMI is designed to track housing markets throughout the country that are showing signs of improving economic health. The index measures three sets of independent monthly data to track improvement in metropolitan statistical areas (MSAs). The three indicators that are analyzed are employment growth from the Bureau of Labor Statistics, house price appreciation from Freddie Mac and single-family housing permit growth from the U.S. Census Bureau. A metro area must see improvement in all three measures for at least six consecutive months following those measures’ respective troughs before being included on the improving markets list. 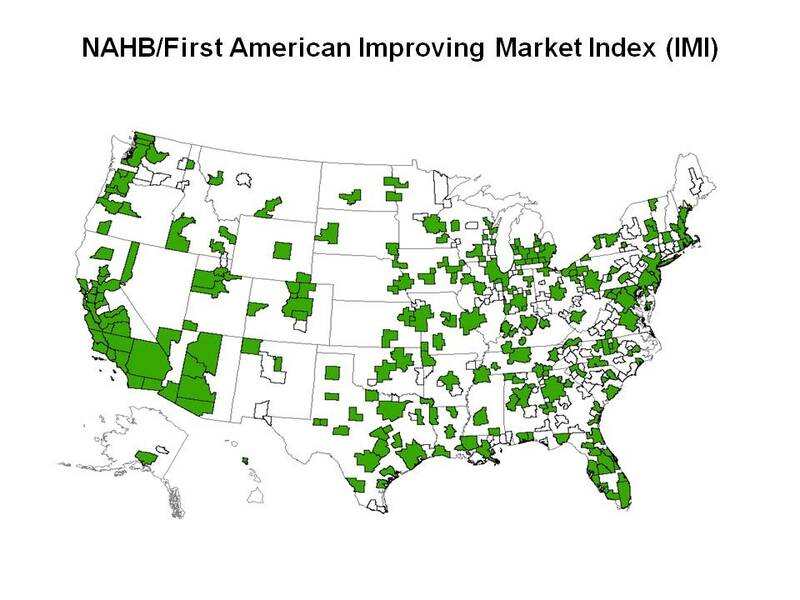 The list of major markets (MSAs) included in the National Association of Home Builders/First American Improving Markets Index (IMI) grew to 274 out of a possible 361 in March, from 259 in February. With 76 percent of the markets included the housing market recovery is on more solid footing than it was at this time last year. The index identifies metropolitan areas that have shown improvement from their respective troughs in housing permits, employment and house prices for at least six consecutive months. The index has shown steady growth over the past year as national measures of housing market improvement including housing starts and house prices have also shown consistent strength. While we expect this positive momentum to continue, it’s important to understand that many markets are just beginning the recovery process, and that numerous issues – from credit availability to the rising cost of building materials and emerging lot shortages – are slowing the pace of that advancement. The expanding housing recovery is energizing communities nationwide by generating jobs and local tax revenues and it could be an even more potent force for economic growth if credit for building and buying homes was more readily available.